Once upon a time there was a rocking chair who wanted very much to be a best friend. 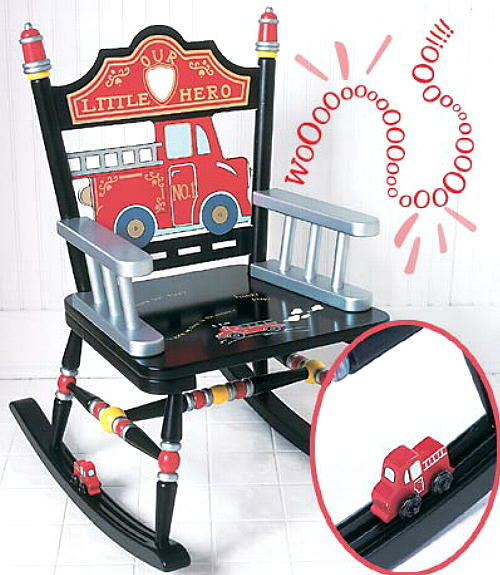 Beautifully handcrafted and hand-decorated wooden "heirlooms-to-be" that are sure to delight your favorite little rocker! Recommended for ages 3-8 (up to 100 lbs). Click on images to view product. 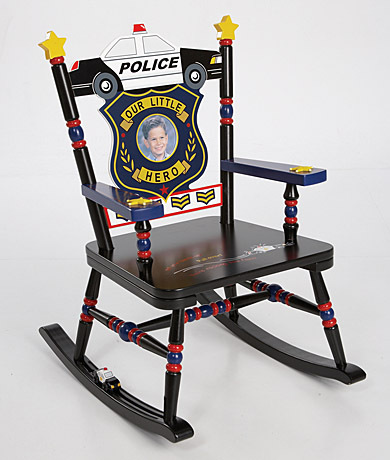 All of our rocking chairs come with a photo greeting card included so child can say "Thank You" in a memorable way. 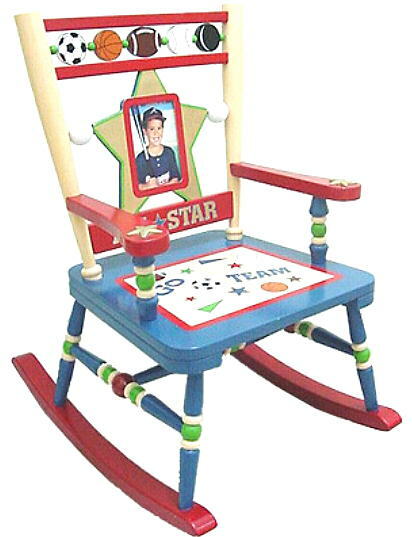 Special understamp beneath the seat that the customer can personalize with the child’s name, the name of the gift-giver, and the special occasion when the chair is received. 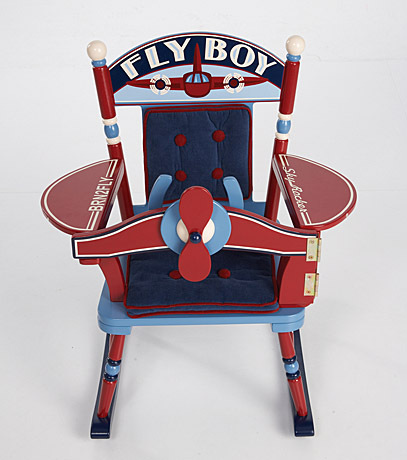 Retro red, white and shades of blue “Vintage” airplane seat back design Comfy padded seat and back cushions Special Message: “Fly Boy” Armrest “wings” labeled with “Sky Rocker” and “BRN2FLY” Working steering wheel turns the propeller Moving “Laugh-O-Meter” & “Flying High” guages Easy to open and close “cockpit” panel. 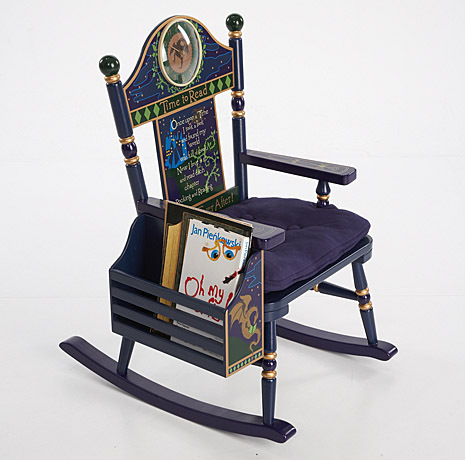 Interior dimensions: 11 ¼” L x 3 1/3” W x 9 ½” H Includes working clock to keep track of little one’s reading time! Fun, vibrant colors with paint brush finials 8" x 10" frame to "exhibit" the budding artist's latest masterpiece! 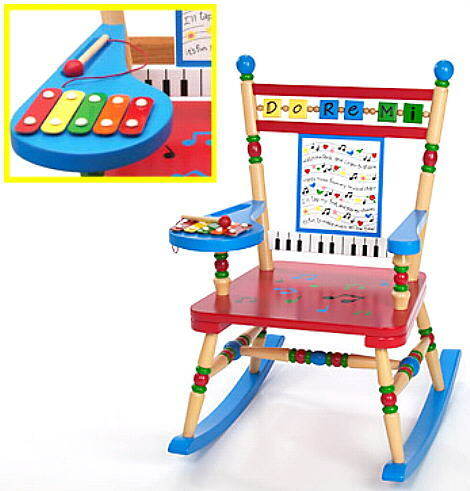 Rotating color wheel on rocker seat back makes learning colors fun! 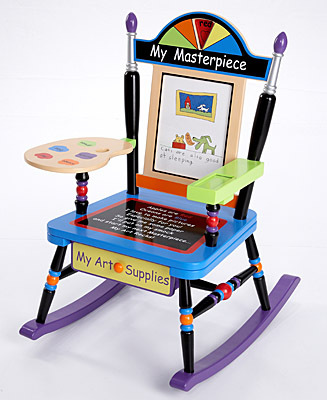 7" x 10" artist's "palette" mini desk Roomy "flip-down" drawer beneath the seat for paper, markers, crayons and other art supplies (Interior dimensions: 9 ¼"x12 ¼") Pencil box armrest with sliding lid. 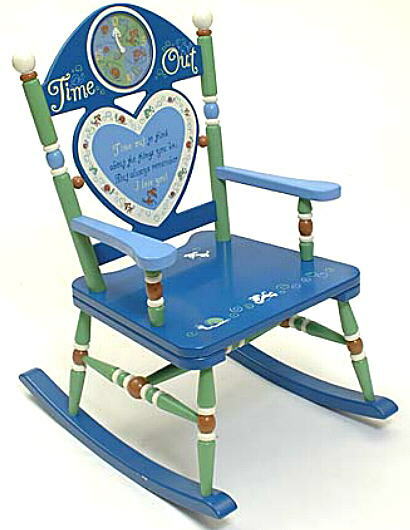 Includes special message for the child: "Time out to think about the things you do, but always remember, I love you!" 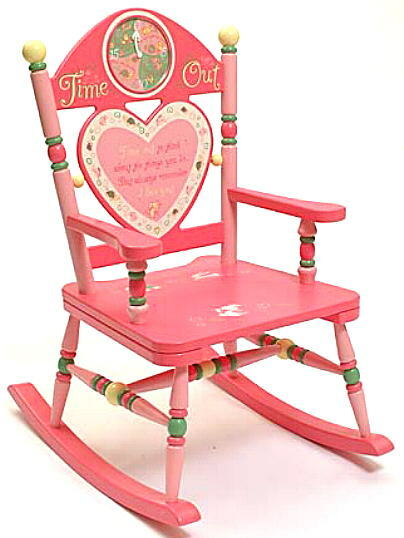 Complete with actual timer you can set for up to 15 minutes Even "time out" becomes fun with this chair! Charming ballet theme with delicate pinks and blues Beautiful floral design backrest with "Prima Ballerina" and 4" x 6" photo frame to showcase her talent! 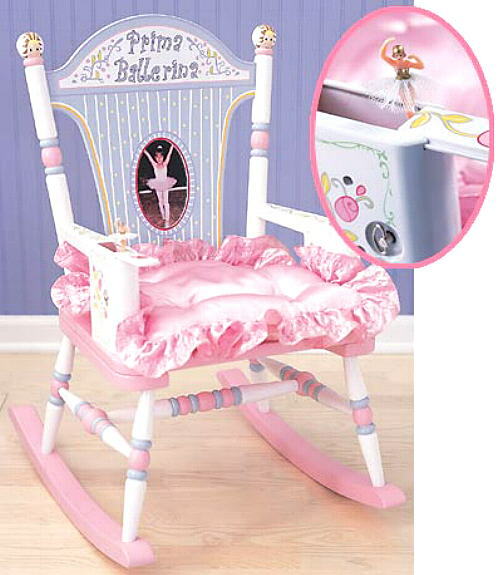 Intricate hand-painted dancer finials Armrest opens to reveal a beautiful musical ballerina spinning to "Dance of the Sugar Plum Fairies!" Removable ruffled seat cushion. 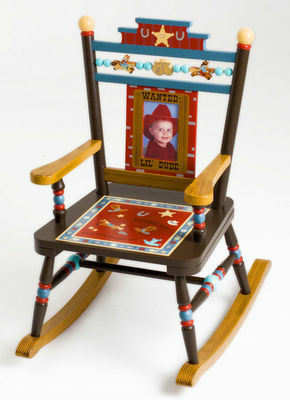 Fun seat back design includes "Good Guy" & "Bad Guy" on horseback with a 4" x 6" photo frame for the Lil' Dude's picture. (Flip the switch to turn it off!) 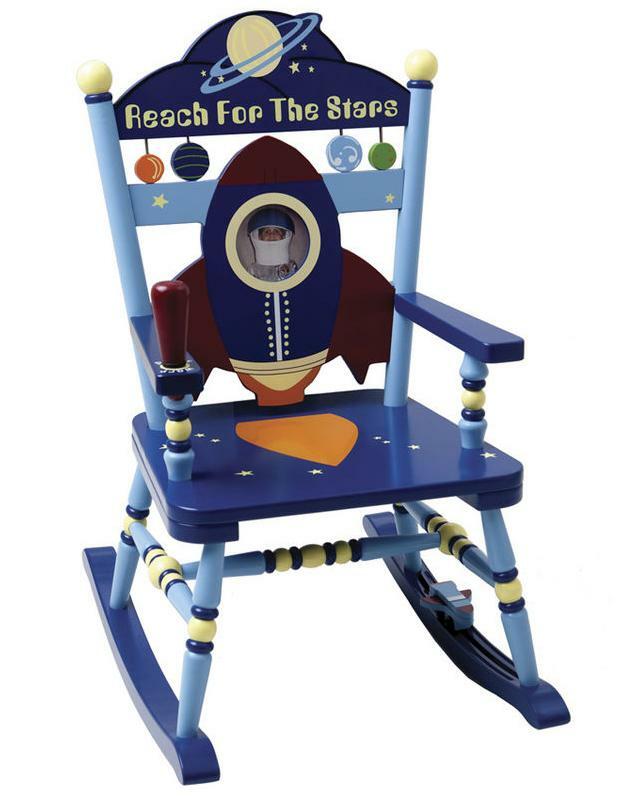 Tiny space shuttle moves along base of chair as child rocks. 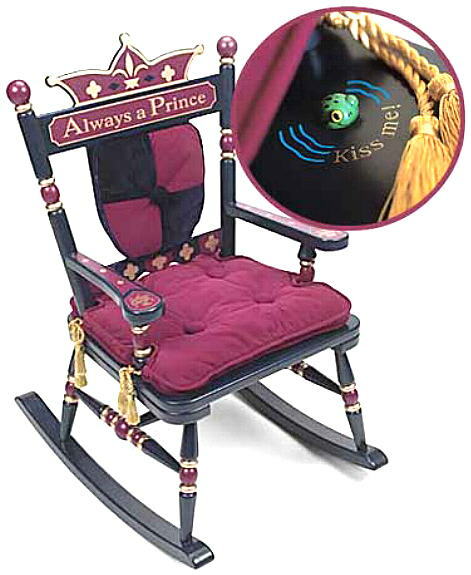 Crown backrest with removable heart-shaped back cushion Special Message: "Always a Prince" Regal padded seat with gold tassels Lift the seat cushion to reveal a Prince-in-the-Making--a green frog! iParenting Media Award Winner! 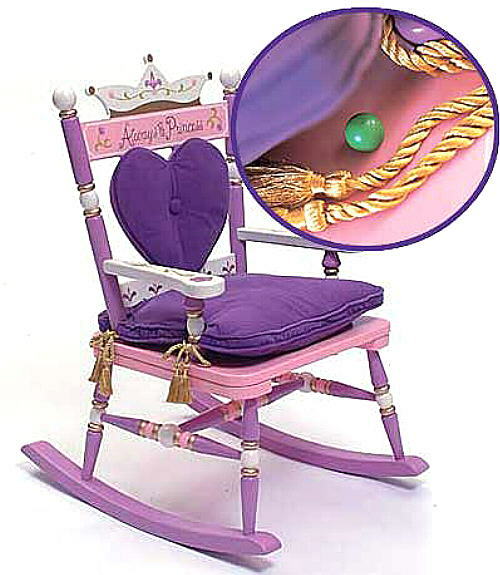 Crown backrest with removable heart-shaped back cushion Special message: "Always a Princess" Regal padded seat with gold tassels We've even included the "test" for all princess--a little green "pea" hides under the seat cushion! 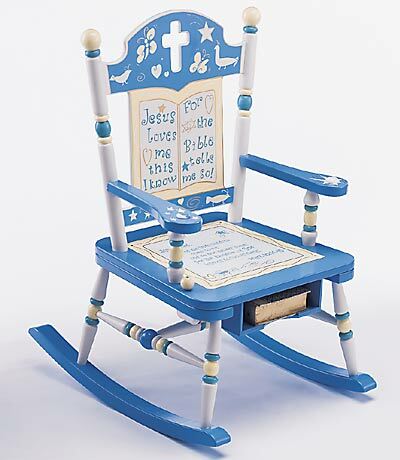 Scripture verse on seat: "Let the little children come to me and do not hinder them, for the kingdom of God belongs to such as these." Mark 10:14-15 Pull ball on seat to hear the music box play "Jesus Loves Me." Shelf under seat is perfect for Bible or other books. Spinning balls--soccer, basketball, football, baseball and hockey. Cheer-ful "Go Team" seat design. "All Star" 4" x 6" photo frame to honor your future MVP! 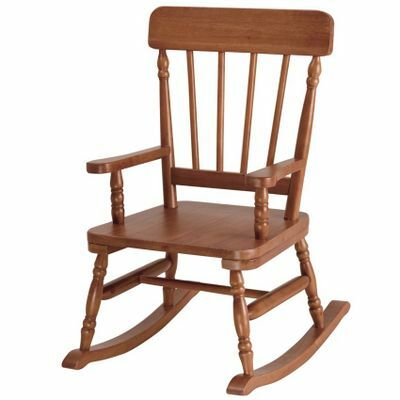 This Classic Oak Finish Chair is the perfect accent for any decor. Photo greeting card included so child can say “THANK YOU”. Includes understamp beneath the seat that customer can personalize. Age 3 to 6, up to 100 lbs. 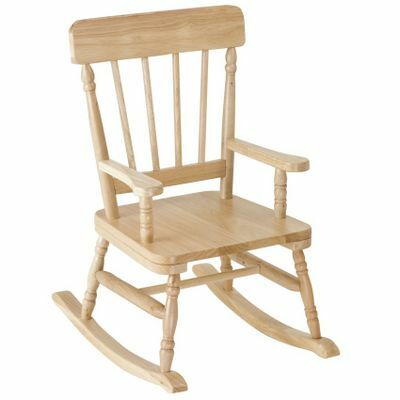 This Classic Maple Finish Chair is the perfect accent for any decor. Photo greeting card included so child can say “THANK YOU”. Includes understamp beneath the seat that customer can personalize. Age 3 to 6, up to 100 lbs. This Classic Espresso Finish Chair is the perfect accent for any decor. Photo greeting card included so child can say “THANK YOU”. Includes understamp beneath the seat that customer can personalize. Age 3 to 6, up to 100 lbs. This Classic Cherry Finish Chair is the perfect accent for any decor. Photo greeting card included so child can say “THANK YOU”. Includes understamp beneath the seat that customer can personalize. Age 3 to 6, up to 100 lbs. 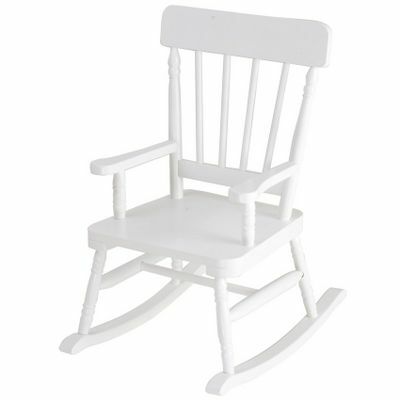 This Classic White Finish Chair is the perfect accent for any decor. Photo greeting card included so child can say “THANK YOU”. Includes understamp beneath the seat that customer can personalize. Age 3 to 6, up to 100 lbs. 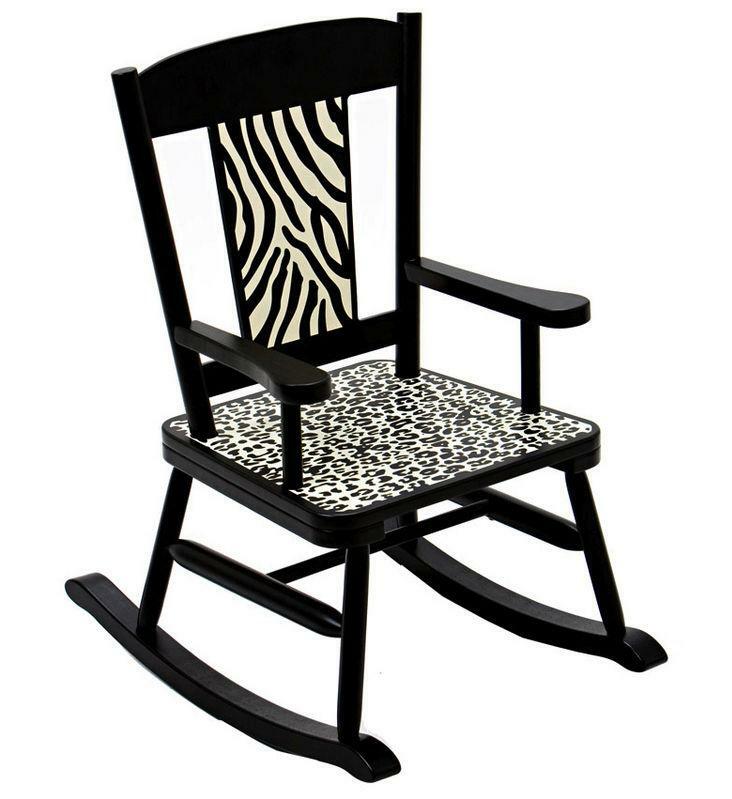 This Wild Side Chair has Cheetah and Zebra prints. Photo greeting card included so child can say “THANK YOU”. Includes understamp beneath the seat that customer can personalize. Age 3 to 6, up to 100 lbs.